Who Brought the Sufis? - JaiBaba.com! Your Avatar Meher Baba Oasis on the net! Back in the 1940s I was a newly minted Sufi hardly dry behind the ears. I was struggling to come to grips with the challenge of having vowed, for the first time in my life, to obey another person, Murshida Rabia Martin, whom, in addition, I still scarcely knew. Yet I was willing to do my best, because I was convinced that the goal was valid and worth probably all the rest of the goals in my life together, and more besides. I had not been a Sufi for very long when Murshida Martin, my spiritual guide, announced to me and other members of the Sufi Order whom she had gathered together in her San Francisco apartment, that she had finally found the successor to her own teacher, Inayat Khan, who had died many years before. She told us his name, Meher Baba, which meant nothing to me, as I had never heard of him. She went on to recount that she had studied during the last two years, for as much time as she could, with two of this great man's students in New York, and that they were coming to the San Francisco Bay Area the following week-end. In fact, they had accepted Murshida Martin's invitation to address her Sufi students at the Fairfax Sufi School, and we were all invited and urged to attend this rare opportunity to hear first hand accounts from direct devotees of the great man, Meher Baba. We all duly collected in Fairfax on the appointed day, and were told many things by Norina Matchabelli, Elizabeth Patterson and Mildred Kyle, a third devotee from the Seattle area. Our Murshida told us that after the Fairfax meeting she would give us two weeks to decide whether we would follow her under the guidance of Meher Baba, or ask her to release us from the vow we had each taken with her on our initiation as Sufis. The story she recounted as the basis for this decision she asked us to make, was that she had asked Meher Baba in earlier correspondence if he would accept her as his student, and when he had agreed to this, she then asked if he would also accept the responsibility for the spiritual guidance of her students. In turn he had agreed to this request as well, assuring her that as soon as he could he would travel to America to meet Murshida Martin as well as his other new spiritual charges. The end result of all this was that everyone then present accepted Meher Baba as their Spiritual Master, and a great project to adapt the Sufi School as a home worthy of Meher Baba's visit began, with painting and pruning and refurbishing everywhere. In turn, Murshida Martin began at once to teach her Sufi mureeds from the charts contained in "The Divine Theme, by Meher Baba" one of the few teaching tools available to Murshida Martin directly from Meher Baba. But her classes were not to continue for long, as soon after she contracted a cancer, and after a rather lengthy battle, succumbed to its inroads. 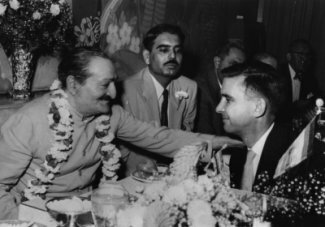 Meanwhile Meher Baba's promise to visit his Sufis was postponed several times, and eventually it was Murshida Martin's successor, Murshida Ivy Duce, who made a special visit to India to meet Meher Baba. I recall her enthusiastic letter to us recounting the reactions of her daughter, Charmian and herself, ending with the clear statement that she confirmed completely Murshida Martin's original decision to put the Order under Meher Baba's charge. This story I have told many times, and included it in a chapter on Murshida Martin in my little book, "Some Results." (see Some Results, Companion Books: "Preliminaries," pp. xi - xiv, and Murshida Martin pp. 1 - 7). I also confirmed the correctness of the entire story, from the India side, with Mani. Some years later, I heard a younger Sufi telling a version of this story that seemed to omit any part of Murshida Martin's turnover of the Inayat Khan Sufis to Meher Baba's care, changing the story from Murshida Martin's orbit and placing it in the new Murshida Duce's area of decision and actions. I chose the first opportunity to tell Murshida Duce of my astonishment at hearing this erroneous interpretation. It never ceases to amaze me how Baba foresees problems and provides for the means of resolving them. When I read the letter I saw at once that it referred not to the passing of the Sufi Order to Baba, but the further and later act of deeding the Fairfax Sufi School property to Baba. My knowledge of this series of events came about curiously through the fact that I had moved to the Sufi School to help with the repainting and repairs for the repeatedly postponed arrival of Baba. During that time Murshida Martin was bedridden. One day she had her daughter Etta Mehdy telephone to her secretary in Fairfax, asking if she could have the gown Murshida Martin had had prepared for her own funeral, to be sent to her in San Francisco. She asked me if I could take the package to San Francisco and deliver it to Murshida, which I did at once. When I gave the package to Etta, she told me that her mother had asked to see me when I arrived. Etta took me to her room and left us alone. Murshida did not look especially weak, and asked me to sit while she talked to me. She then did something completely out of character and began a story at the time of Inayat Khan's departure in 1927 for India and his instructions to Murshida Martin on the manner she should employ to reach him in case of any emergency. This was to use Samuel Lewis, who, Inayat Khan told Murshida Martin, was quite able to transmit and receive messages psychically. Then Inayat Khan died. This last instruction Murshida Martin had presumably not forgotten. Soon, however, she had the impression that the replies received by Samuel from Inayat Khan, always seemed oddly slanted to Samuel's own tastes, desires, and good. When I explained this long story, which I had heard directly from Murshida Martin on her last living day, to Murshida Duce, she said then that she had misinterpreted the intent of Murshida Martin's letter to Samuel, and she would have to correct the matter. But as the years rolled along, I found she had not kept her promise; So, the confusion has apparently continued until the present day, which is why I am recounting this, as I believe I am the only living person who knows the complete facts. On my return last week from a series of travels I found in my mail the latest copy of "The Glow," containing the very special information on the history of Meher Baba's taking on the spiritual responsibility for Inayat Khan's Sufi Order, and its present manner of achieving the aims set out for its activities. I would like to say that I felt Naosherwan's product in this issue answered a perhaps overdue detailed presentation for the Baba world on this subject, which I know to have been so close to Baba's heart. However, it still contained the old confused version of Murshida Martin having intended to turn over the Sufis to Meher Baba but not having done so. It is certainly time now for this erroneous account to be corrected and the accurate version to be placed in its stead. Murshida Rabia Martin brought the Sufis to Meher Baba, I was there.